Winter - Rocky Mountain Great Dane Rescue, Inc.
Hey there, I’m Winter! 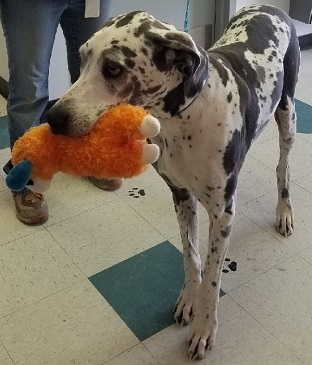 I’m a 6 year old harlequin female Dane with natural ears. I’ve been bouncing around from place to place for a bit, so I’m super excited to find a forever home of my very own! I’ve done well with the other dogs and cats in the shelter, but I’m a little nervous when new people come around ~ I warm up quickly though. And I’ve done really well with the junior volunteers at the shelter. I know all of my basic commands and am housebroken. I’m also really good on a leash and I absolutely love carrying toys around with me, it’s kind of my thing. I think that mostly covers the big important things, but why don’t we get together to see if you could be my forever family! I am being fostered in Wyoming.